Once I started photography as a hobby, I started to notice light. I discovered a vocabulary I’d never needed before then. Light became buttery, diffuse or sharp. Sometimes it made things glow and sometimes it made them one-dimensional. I discovered that golden light can make me happy and noonday sun makes me nervous. I marveled at the amazing light that comes right after a storm, when the sun and clouds work to create shafts of light that spotlight raindrops and if you’re very lucky, offer rainbows. Yellow tulips after the rain. While light may be of particular interest to photographers, I suspect there is a larger connection to the way we all live. Noticing the light is noticing the present moment. What are the qualities of right now? We may start with how we feel and that’s not bad, but there are many other things we can notice. What does the air feel like on your skin? What parts of your body are in contact with the earth right now? What can you hear? Are there smells you can distinguish? The words you use and the things you choose to notice change the light in your internal viewpoint. It can soften the edges or cast unflattering shadows. But unlike the light outside, you have control over it. Through practice and awareness, you can learn to pay attention to your internal light just as a photographer notes external light. You’ll know when conditions are difficult and revel when they are good. To stretch the metaphor just a little further, adept photographers can work in any light. Through choosing the right lens and shutter speed, and applying tools like polarizing filters, they can bring the color back to a sunbleached scene or photograph the stars of the Milky Way in the middle of the night. 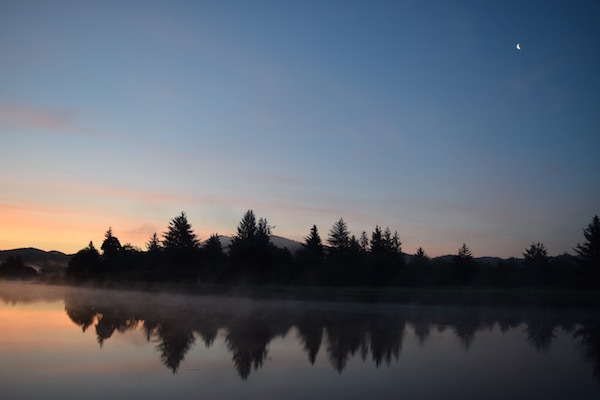 Dawn on the Nehalem River. Meditation and mindfulness practices are similarly powerful tools for helping us work with our own internal light conditions: first by noticing, then by learning to accept all conditions with equanimity. They are tools we can learn to use with the same ease that a photographer sizes up a scene and adjusts her gear. But it all starts with paying attention. What is the light like where you are? All pictures taken by me over the past few years. Thanks for sharing with Robyn to share with me. Stunning photos! Thoughtful prose. I’ve always been sensitive to light. You’ve opened my eyes to think about it in new ways. Thanks Lora.